“Why fit in when you can stand out?” That is the message we conveyed to our students on Sampoerna Academy Moving Up Day and Graduation Ceremony. The celebratory event was held on all our campuses earlier this month. Our Kindergarten students celebrated by performing songs and dances that showcased the progress they made throughout the year. Additionally, our Kindergarten 2 students shared what they wanted to be when they grew up to us. We were rather amused that some of them wrote ninjas as their answer. “Kindergarten 2 is a crucial stage of education as what children learn at our international school in Jakarta will determine how well they perform at Primary level. Here, we teach students how to count, read, and write in a fun way. They also learn essential skills for the 21st century such as communication, collaboration, critical thinking, and creativity. In addition, we also teach them honesty, compassion, kindness and courage,” said Frida Dwiyanti, Principal of Sampoerna Academy, Jakarta. Having graduated from Sampoerna Academy, our high school students are ready to enter a brand new chapter in their life at their chosen university. This year, our graduates will pursue their tertiary education abroad. These students can pursue any major of their choice at top universities in the U.S. and U.K. The key factors to their smooth transition are our strong STEAM Education and Cambridge curriculum, and the flexible education pathway within Sampoerna Schools System. “As we look back to our three spectacular years together, it is clear that our time in Sampoerna Academy has shaped who we are today. Without the support of our family, none of us would have come this far. 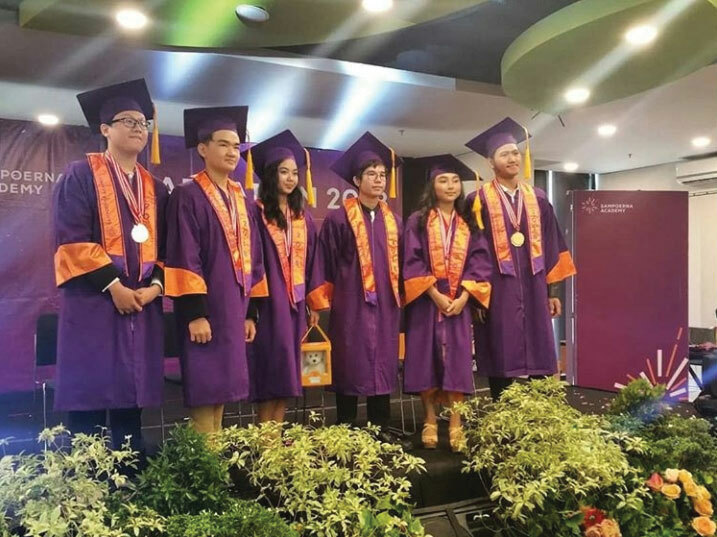 Without the mentoring of our teachers, we couldn’t have accomplished many things”, said Muhammad Rafi Fadhil, this year’s valedictorian from our Jakarta campus who went on to study Food Science Technology in Pennsylvania State University. With every passing year, we can see our students become more skillful, responsible, and self-reliant. For this pleasure, we would like to thank all parents who entrusted their children to us and all teachers for their devotion. We also applaud our dearest students for both their academic and non-academic achievements this year. Let us continue to embrace our individual strengths and strive towards excellence.